"Preparing for the Future, Preserving the Past"
NYALGRO, New York Association of Local Government Records Officers, is a non-profit organization formed to provide a network to all who are responsible for records upkeep and information management for local governments, such as, towns, counties, cooperative extensions, cities, fire districts, school districts, villages and BOCES. NYALGRO is a proven advisory network for the development of sound records and information management programs. Download brochure. Come join us in conversation...follow us on Facebook! Representatives from counties, towns, villages, schools, fire districts, and cooperative extensions attend the NYALGRO School to learn about the latest technology and find solutions to their records management problems. Find new customers and connect with key players in records management. 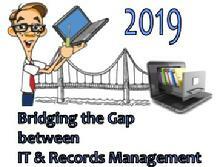 Learn about current records management needs from the customer. This is an exceptional opportunity to show off your products and promote your expertise to records professionals across the state all in one location. This award is given to a NYALGRO member who demonstrates outstanding service to his/her local government and New York's records management community. The award is named after a clerk who worked in the Albany County Clerk's Office in the latter part of the nineteenth century. Wheeler B. Melius gained his notoriety when on February 10, 1880 he was the first to reach the burning Albany City Hall which housed an immense quantity of public archives and legal records. Melius, once on site, began to pass precious volumes of land records through a narrow window to volunteers outside. Single-handedly, Melius passed 700 volumes - nearly six tons of charred and often soaking, outsized books - out of the building. The Guy D. Paquin Award is presented to an individual or organization to honor noteworthy achievements and exceptional support and involvements in the records management profession. NYALGRO presents its Robert Arnold Award for Distinquished Service to an individual who has demonstrated characteristics similar to that of a Regional Advisory Officer in lending expertise and assistance to other local officials in the establishment of furtherance of records management programs.